The first day of the 15th Slovenia Open Thermana Laško is behind us. This day has brouthg great happiness to the Slovenian team. 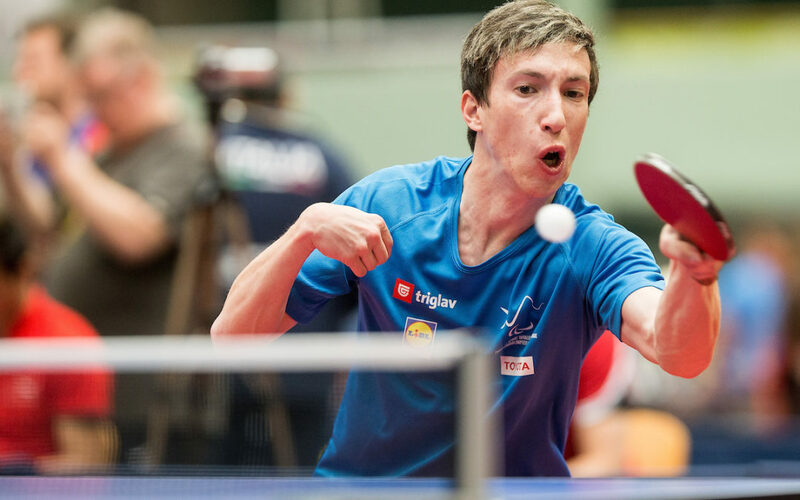 Luka Trtnik and Andreja Dolinar have ranked in to the eight finals, which starts tomorrow after 9 am. At night will be held another draw, that will bring opponents to Slovenian representatives. Barbara Meglič, Bojan Lukežič and Primož Kancler have unfortunately finished with the singles part of the competition. „The tournament is really interesting and of great quality. All praise goes to all the competitors who have taken this tournament another step further. You can see that the favourites improved their shape and condition and that they’ve easily caught the rhytm of the competition. There are quite a lot Asian athletes in the competition and also many Europeans. Both are a little surprised by the quality of the competition,“ said Gorazd Vecko, technical director of the tournament and head of British team. He pointed out three surprises: surprising defeats of Swedish Anna-Carin Ahlquist and Turkish Abdullah Ozturk. British Will Bayley also had to work pretty hard for the win. „A hard day is behind me … Full of emotion and confusion … I had my mind full in the first game. In thoughts I was with my sick father, than again in Laško … I had to fight hard for each point. Thanks to my team for being there for me in hard times,“ Ahlquist di n’thide her emotiond. “We will not surrender, yet. I believe I will manage to defy the wave of young athletes for quite some time. But most of all I want to play as my coach wants me to. All with the desire to be in the optimal form for October World Championship in Celje,“ Serbian Borislava Perić-Ranković, current Paralympic vice-champion, revealed her philosophy. „Tha favourites are put to the test, the are expected to win,“ added Vecko, who couldn’t hide his enthusiasm, when talking about 20-year old Luka Trtnik’s success. Trtnik defeated Slovakian player Jambor and Hong Kong player Lee with 3:2. Dolinar’s ticket to eight finals was victories ver Austrian Heidi Koller (3:1) and Russian Ekaterina Popovovo. However, she didn’t manage to tame Serbian Nada Matić (1:3). .
„This is unbelievable. I wasn’t expecting this. Both games were extremely hard: physically and emotionally – they were 5 sets long. I am happy that it ended the way it did. Hard work pays off,“ was young Luka Trtnik extremely pleased with today’s outcome. “I am very happy with the results, because I came here with no expectations. I just wanted to play the best that I could. We will see how it’ll go on. Step by step,“ said Dolinar, who hasn’t come this far since 2014. „Today was really good. I can see improvement of Luka Trtnik, who easily progressed to the eight finals. With this he announced the collecting of points in 2019 for Paralympic Games in Tokio 2020,“ was Damijan Lazar, the president of the Sports Federation for the Disabled of Slovenia, happy about Trtnik’s success. Lazar also pointed out that Andreja Dolinar’s hard work and perseverance had also been awarded.